Lake Michigan fishing yields some great salmon, and now's your chance to grab some big money along with those fish! The Ludington Offshore Classic sponsored by Captain Chuck's takes place July 18-24, 2019. Over $87,000 in cash and prizes were awarded in 2017. This tournament is open to any boat 18' or longer equipped with a marine radio. Shotgun starts are at 6am and by 2pm, all boats must be inside the pier heads (except for Youth Tournament, where boats must be in by noon). Weigh-ins are at 3pm at Waterfront Park. The 2018 winner in the pro division was the crew of My Tyme and they claimed the $10,000 top prize. The amateur division was won by Got Fish?, based out of Manistee. The big fish winner was the crew from In-U-Endo, which reeled in a king salmon weighing 27.2 pounds. Over 100 boats entered this year's tournament. The winner of the Big Boys competition was the team from Work-N-Bites/Diabolical for a 28.8 lb. king salmon. They took home $21,700 for first place plus $1,000 for the biggest fish. There were 31 entries for the $31,000 purse. $10,000 1st Place Pro (based on 30 boats). 100% payout guaranteed. 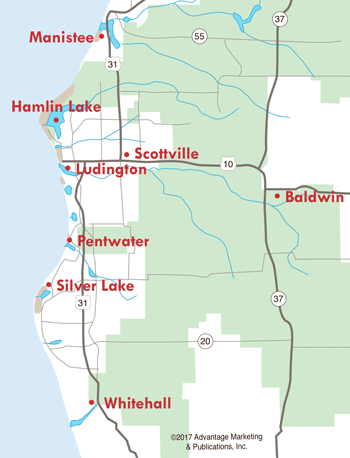 Some have called the Ludington tournament one of most organized and best run tournaments in four states, and it is the largest freshwater salmon tournament in the United States. All tournaments begin at 6am and end at 2pm, except for the Youth Classic, which ends at noon. Boats must be inside Ludington Pierheads, 2pm. Betten Baker Ford and Dreamweaver Lure provide free beer and brats to all participants. Captain's Meeting 5:30pm at Waterfront Park Tent Site. Boats must be inside the Ludington Pierheads, 12pm. Boats must be inside the Ludington Pierheads, 2pm. On-site registration, 3-7pm, tournament tent. 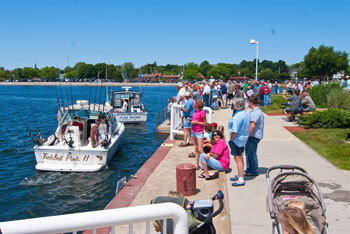 Ludington Offshore Classic Pro/Am Captains' meeting, 7pm, Waterfront Park. Awards immediately following weigh-in, tournament tent. The Fish Hawk Big Fish Tournament will be held during the Ludington Offshore Classic Pro/Am Tournament. Big boys tournament Captains Meeting, 6:15pm, Waterfront Park. For more information, contact the Ludington and Scottville Chamber of Commerce at (231) 845-0324 or (800) 783-4456. Also see the official website at www.ludingtontournament.com for registration and more information. Check out Ludington Lodging for places to stay during the Offshore Fishing Classic and Ludington Restaurants for great places to eat.